Finances made Tidewater Community College the best choice when Megan Hodges graduated from Western Branch High School in 2013, and she figured a path in general studies would be her best option. Then she discovered a gem, the Visual Arts Center at Tidewater Community College, where she knew her creative skills would allow her to flourish. 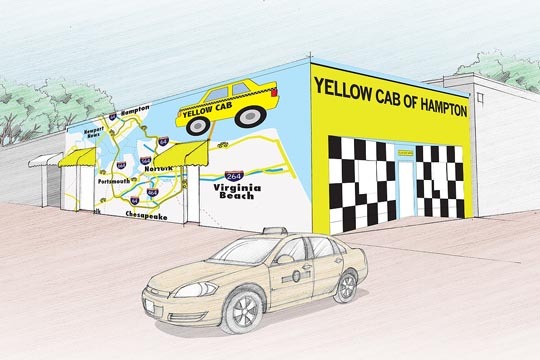 Soon anyone who drives by Yellow Cab headquarters at 12 Armistead Ave., in Hampton will see Hodges’ work in plain view. Her design for a mural took first place among 1,500 entrants in a recent company contest open to all college students in Hampton Roads. Hodges won $2,500, and her design, “All Hail Taxis,” will be painted on the building by muralist John Hickey (he is the artist who painted the mural inside Building A at TCC’s Portsmouth Campus). The award winner features a cab above a map of Hampton Roads’ major roadways. The brilliant yellow scheme reflects the colors on the Yellow Cab website. Completing Computer Graphics I and II at TCC led to Hodges’ proficiency in Illustrator, which helped her create the innovative design. Online voting narrowed the top six designs to three, and the company picked the winner with students from Virginia Wesleyan College and Norfolk State University placing second and third, respectively. Hodges is one class shy of earning her Associate of Applied Science in Graphic Design – Specialization in Multimedia. She is seeking an internship in graphic design before deciding on further schooling, eager to show off a portfolio she built at the VAC. Ultimately, she is hoping to illustrate children’s books or become a film editor. While she enjoyed coloring as a child, molding pots in high school ceramics and designing posters and websites as a college student, it will be a special feeling to see her work brightly displayed on the front of a building.